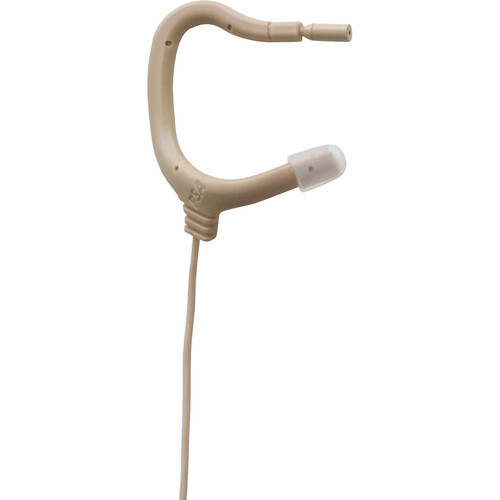 The beige Point Source Audio EO-8WL-XMP-BE EMBRACE Omnidirectional Earmount Lavalier Microphone is an ear-mounted microphone that provides pristine sound quality with a secure and comfortable fit. It is ideal for capturing vocal performances in theater, broadcast, film, corporate, and other applications where the performer's microphone needs to be concealed. This omnidirectional microphone delivers 136 dB maximum SPL with a 20 Hz to 20 kHz frequency response and high-gain before feedback, making it well suited for use in low- to moderate-noise environments. It is mounted on a flexible boom which bends up to 360° and allows the miniaturized capsule to maintain consistent placement at the corner of the mouth for an even sound quality, regardless of head movement. The EO-8WL boasts an IP57 waterproof rating and is protected against water, sweat, and makeup. For a precise custom fit, you can bend, shape, and trim the included earmounts, and choose between left- or right-ear placement. This headset comes with an XMP interchangeable 4-pin mini XLR locking-ring X-Connector for Mipro wireless transmitters. A windscreen, two clothing clips, and a cable clip are also included.